Now in its 15th year, Lutron Electronics annual Excellence Awards competition recognizes Lutron system providers around the globe. InnerSpace Electronics, Inc., a premier custom electronics and home technology integrator has won the 2018 Excellence Award for “Best Use of Lutron’s High-Performance LED Fixtures” from lighting and shading control leader Lutron Electronics. The announcement was made at the Custom Electronics Design and Installation (CEDIA) industry leading conference. 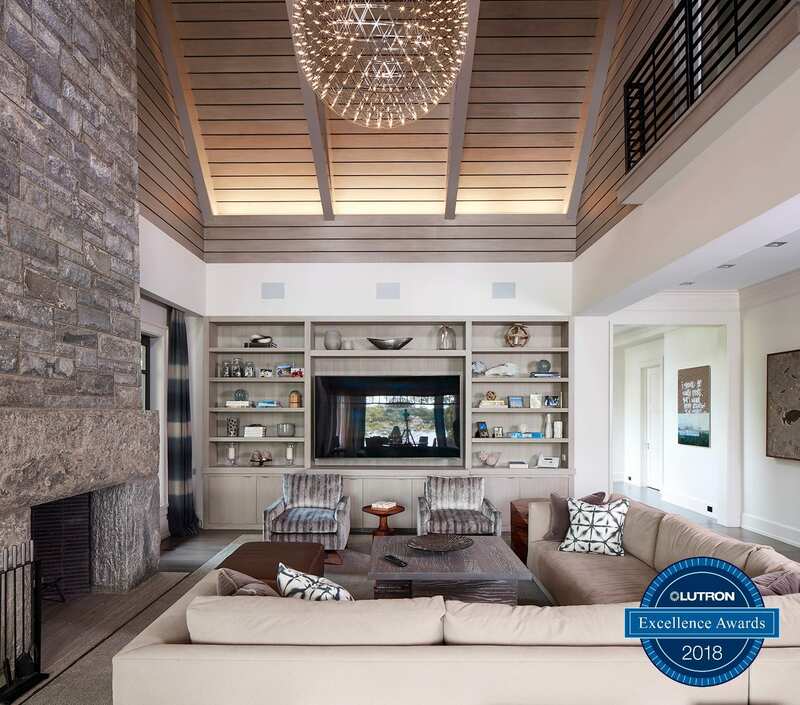 Established in 2003, the Lutron Excellence Awards competition recognizes the world’s best projects that use Lutron lighting, shading, and temperature controls, Lutron Ivalo fixtures, plus third-party equipment, voice control, and more. More than 100 of Lutron’s residential system providers have won a total of 160 Excellence Awards since the competition’s beginnings. “Lutron lighting control systems have been part of our service catalog for many years. Our expertise in designing sophisticated lighting control systems and the support we’ve received from Lutron has enabled us to expand our business and knowledge base into additional segments of lighting including lighting design services, and specifying and supplying light fixtures. Bridging the gap across all facets of a lighting plan, we have the ability to deliver on high-performance, energy-efficient, and award-winning installations that enhance a space and provide overall peace of mind”, said Barry Reiner, President of InnerSpace Electronics, Inc. This year’s competition received more than 100 entries from around the world, which were judged by a panel of industry veteran journalists. Learn more about our lighting services here or contact us to schedule a consultation. Light is an important part of our personal environment. It affects how we see and how we feel. We spend most of our lives under electric light – in our homes, schools, offices, stores, even outdoor spaces. But not all light is created equal. The right light helps us live and work better. It can make visual tasks, such as reading, easier. It can set the mood for a space – vivid and energizing in a home office or gym, or warm and intimate for a dinner party. It can accentuate the colors and textures of fine furnishings. The right light may even help us sleep better. For over 30 years we’ve been involved in controlling these environments through lighting control systems such as Lutron, working closely with architects, home builders, and interior designers to create programmable environments based on a client’s needs and desires. A residential project’s lighting control is directed through predetermined lighting plans and typically contains specified fixtures selected in earlier phases of construction that may present challenges when it’s time to program the control system. This can cause a great deal of strife for all parties involved and even delay a project while sorting out compatibility issues between fixtures and programming. As A/V and Lighting Control Specialists, the lack of control we have on a project at this stage of the game opened up an opportunity for us. It was important to claim a majority stake in the lighting development stage to ensure the best possible lighting experience and control for our customers. In order to achieve this we invested in our tenured lighting control engineers and provided them the means to earn their certifications as ALA Lighting Specialists, and in Lutron HomeWorks Illumination and QS. Additionally, through our long-standing partnership with the nationally recognized Home Technology Specialists of America (HTSA), we have access to an expert designer to support our team. Our service benefits projects of any size that lack an appointed lighting designer or need a backup design team to review existing plans and provide recommendations that will further enhance the original design. Resources geared up, our next step was to expand our brand portfolio to include lighting fixtures giving us greater leverage to specify and sell high performance, energy efficient, state-of-the-art LED fixtures that are compatible with the most popular lighting control systems. We are pleased to announce our new offerings from Lutron Ivalo Finiré, USAI Lighting, Ketra, and DMF Lighting. Whether for new construction or retrofit renovation projects, we have an appropriate fixture that fits. With a range of color options, from classic, consistent white, to dimming cycles that stimulate the patterns of natural daylight, to a rainbow of saturated colored light, the possibilities are endless. Through direct relationships with these manufacturers, we are competitively priced to meet a variety of project scopes and budgets. Lead times tend to be reduced by cutting out multiple middle men commonly used in traditional purchasing channels. Furthermore, coupling our design services at the beginning with specifying and purchasing the fixtures in the middle alleviates any compliance issues at the last stage when it’s time to program the lighting control system; therefore, miscommunications are prevented, delays are lessened, budgets are met, and longstanding relationships are developed. The investment in developing our working knowledge of lighting from conception, to specification, to execution has captured gains in delivering award-winning environments. Most recently we were named the winners of the 2018 Lutron Excellence Award for Best Use of Lutron’s High-Performance LED Fixtures. The winning project conjoined all trades – architect, lighting designer, home builder, and InnerSpace; and resulted in a truly unforgettable classic, shingle style home overlooking the Long Island Sound. The lighting plan was designed to illuminate the space while highlighting all the fine details and rich finishes. With a project scope of over 330 Lutron Ivalo Finiré fixtures and 144 circuits of lighting, the ability to partner up with the contracted lighting designer to assess the plans and supply the fixtures was helpful in meeting budgetary requirements, and allowed InnerSpace Electronics to provide a beautifully designed and functioning Lutron QS system to the homeowner. To learn more about our lighting design services and our lighting brand portfolio click here. To schedule a demo please contact us.